Overall, this was a pretty entertaining game and not just because my team won. There were a bunch of interesting moments in this game, as well as a few frustrating ones, one scary one, and for me, one that was terrifying. The Black Wolves have shown a number of times this season that they can play with the big boys. In their first two games they were not only good but dominant – beating the Bandits and crushing the Knighthawks. Then they lost 8 of their next 9 but other than a couple when they got smoked, they looked pretty good even in most of the losses. They certainly put up a good fight in this one as well, and if making the Rock fans nervous in the last few minutes of the 4th quarter was their goal, then mission accomplished. But that’s not to say that they kept up with the Rock’s level of play throughout the game. Far from it. The Black Wolves actually outplayed the Rock for most of the first half, despite holding a lead for less than six minutes. Their defense was stifling, and Toronto had trouble getting shots off. Many Rock possessions ended with the ball being harmlessly tossed into the corner or just put on the ground since there was no chance of even a desperation shot. The Rock did get a few goals, but all of them from special teams. The Rock’s first seven goals of the game consisted of 4 power-play goals and 3 shorthanded ones. Their first 5-on-5 goal happened five minutes into the third quarter, and in the end only five of their fifteen goals were 5-on-5. When both teams were at even strength, the Rock were simply outmatched. If New England’s power play wasn’t so terrible on Friday, things might have been different. I was almost waiting for the Rock to start chopping at people to get penalized since they were playing better with only 4 players than with 5. My terrifying moment came during the second quarter when the Black Wolves tied it at 4 and I realized that not only were the 12-4 Rock getting outplayed by a 4-9 team, but that the Rock were 3-3 in their last 6 games and other than against Vancouver, haven’t looked as dominant as they did in the first part of the season. I remembered Melissa asking on a recent Addicted to Lacrosse show whether the Rock had peaked early and would head into the playoffs on a downside slide – the terrifying moment was when I thought that she might have been right. And then we got to the second half. The Rock’s offense was better in the second half than in the first, but still wasn’t clicking as well as earlier in the year. I wondered if they were really missing Rob Hellyer, but it could also have been the strong play of the New England defense. (I also wondered if the distraction of learning they might get Colin Doyle back and then finding out just before game time that they wouldn’t might have been a factor, but I don’t think that was it.) I didn’t think the Rock D played great in the second half (I remember two plays when Jeff Gilbert got beat 1-on-1), but Brandon Miller stepped his game up a few notches. He was not fantastic in the first half, but good enough to keep his team in it. In the second half though, he was lights-out and was much of the difference in the game. This seems backwards since the Black Wolves scored 4 in the first half and 8 in the second half, but they also took seventy shots on the night. Seventy. Brett Hickey had a great game. His 3G 5A brought him to a league-leading 46 goals (tied with Curtis Dickson) and he’s now in 12th with 76 points. Stephan Leblanc’s 1+7 bumped him into a tie for 4th with 86 points, but I have to give kudos to Leblanc for his work ethic. At least twice I watched him fighting in the corner for a loose ball near the end of a Rock possession, while 2 or 3 defenders were pounding on him and most of his teammates were already heading towards the bench. One of these times led directly to a New England penalty, and the Rock scored on the ensuing power play. Nice job Steph. Early in the 4th, Jesse Gamble fought with Mike Manley. While Manley was walking to the penalty box, Gamble was holding his hand up and went to talk to the refs. He then went to the dressing room and did not return. I’m 95% sure I saw him say “he bit me” to the Rock bench on his way off the floor. Sandy Chapman scored a nice transition goal in the 4th and the Black Wolves challenged it since it looked like he might have stepped on the crease line just before shooting. A replay showed that he tiptoed near the line but never touched it. He expertly danced around the crease like he does it 40 times a year. It was actually the 32nd goal of his 14-year career. Also in the 4th (the 4th was definitely the most interesting quarter! ), the Rock challenged a goal that had been waved off. I’m pretty sure the ref never went to the replay booth at all but the call on the floor was overturned and the goal counted. I don’t think I’ve seen a call changed without the actual replay. Maybe the other ref saw it clearly and was positive about it while the original ref had some doubts about his own call, or the original ref immediately realized he’d called it wrong and didn’t bother going to the replay to correct it. It makes you wonder if the call would have been reversed if the Rock hadn’t challenged it. The Rock took three Too Many Men penalties. Once in the third, they sent five men out when they were killing a penalty. It looked like they just forgot that they were on the PK. In the fourth, they took a “normal” too many men penalty, and while killing that one, they took another one – they just forgot again and sent out five players. That’s when Billings scored, otherwise the Rock would have been down 5-on-3. Andrew Suitor was covering Kevin Crowley in the New England end, when Crowley gave Suitor a fairly innocent-looking push and Suitor dropped and did not get back up. A few minutes later, he was carried off the floor and did not return. I remember watching the Minnesota game in 2013 when he blew out his knee and was carried off the floor then, and so this seemed eerily familiar. He missed the rest of that season (11 games), so hopefully this injury isn’t as bad as it looked. We’ve all seen the kiss cam, the dance cam, and recently I’ve seen the “show us your muscles” cam in some arenas. Ah, the joys of watching the Jumbotron feed over the internet. Anyway, the Rock started a new thing during this game: the beer belly cam. Yes, they showed men with, um, significant girth around the middle section, showing off what they had. I really hope that idea dies a quick and painful death. After the game, my son spotted a wallet sitting in a cup holder a couple of rows ahead of us. He asked the guy sitting next to it if it was his, and he said “Oh, yeah, that’s mine.” On our way out, we heard a different guy frantically talking to the usher about losing his wallet. He said he was sitting “right there”, pointing to where Nicky had found the wallet. We told the usher we’d found it and she went to talk to the other guy who claimed it. She came back with the wallet but when they went to check what was in it (i.e. hopefully some picture ID so we could tell whose it was), it was empty. No cash, no ID, nothing. The guy who said it was his was nowhere to be found by then. Douche. Shawn Evans: Best player, MVP, or both? Shawn Evans is having an amazing year. He’s currently 4th in the league in goals, 2nd in assists, and first in points. He’s averaging 7.5 points per game, and is on pace for 135 points, blowing the current record of 116 out of the water. The next closest player in points is 16 back (in one more game) and the next closest in points per game is almost a full point behind. He’s leading the league with 5 shorthanded goals, the same number or more than three teams. He is leading the Roughnecks in points by 31. So he’s a strong candidate for MVP, right? Well yes, except for the fact that the Roughnecks are in last place in the league and are currently in last in the West, which could mean no playoffs for the Roughnecks for the first time since their debut season in 2002. Can you give the MVP award to a player on a team that doesn’t make the playoffs? It has happened once in the NLL. In 2001 John Tavares won his 3rd MVP award for (guess who?) the Buffalo Bandits. That year, he set the points record of 115 which stood for over 10 years and outscored the Gait brothers (who tied for #2) by 25 points. But the Bandits were 5th in the league with an 8-6 record, a game out of 4th. Only 4 of the 9 teams made the playoffs at that time, and the Bandits just missed. There were four teams below them in the standings. Six of the 9 teams make the playoffs now, and there ain’t nobody below the Roughnecks. It’s hard to answer the question of whether Evans is deserving of the MVP award until you decide what MVP really means, and this comes up near the end of every season as well as every baseball season, hockey season, any sport that features an MVP award. The CFL wisely calls theirs the “Most Outstanding Player” award, so they don’t need to define “valuable”. But we do. Should the MVP award simply go to the best player? Or it it truly based on how “valuable” the player is to their team? Maybe the award just go to the top scorer; that’s certainly been the trend of late. The last three MVPs (Jamieson, Evans, Grant) were also the top scorer of the year. Actually, it’s not just a recent thing; it’s been the trend all along. There have been 21 MVP awards given out by the NLL. The winner has been either #1 or #2 in the scoring race 16 of those times (and #3 once). In fact, a purely defensive player has only won twice – Steve Dietrich in 2006 and Jim Veltman in 2004. Chicks dig the long ball. By that standard, Evans is the MVP, almost without question. But is he actually the most “valuable” player? Does he mean more to his team than anyone else? That’s harder to argue. A player being “valuable” to his team implies that his team had some significant level of success, or their value wouldn’t be much. The Roughnecks could have missed the playoffs and ended up last with or without Evans. Would the Rush be where they are without Mark Matthews or Aaron Bold? What about the Rock without Josh Sanderson? Or the Knighthawks without Matt Vinc? But if history is any indication, “Most Valuable Player” is simply the name of the award. If it was truly named after who receives it, it should actually be called the National Lacrosse League Best Offensive Player Unless No Offensive Player Has A Really Standout Season And A Defensive Player Does award. The season isn’t over yet and so we can’t say for sure but for my money, Evans is at the top of the short list, regardless of how the Roughnecks finish. With four and a half weeks left in the 2015 season, the playoff scenarios are just starting to be decided. We know Toronto and Colorado are in. We know a couple of other teams (Edmonton, Rochester) are on the cusp and can clinch a playoff spot with a single win. We know that Toronto can finish no worse than third because they can’t have more than 7 losses and New England and Minnesota already have 8. Here are a few playoff scenarios that are still technically possible, though the odds of some are exceedingly remote. I will update this posting after tonight’s games as things change. Update: I’ve updated these scenarios in red after the games of April 4. Edmonton is 1-1 against Calgary and in this scenario, they will lose two more. Calgary ends up third and in the playoffs and Edmonton is out. With their win against Vancouver, Edmonton can finish with no more than 9 losses. Vancouver has 9 losses now but Edmonton holds the tie-breaker, and Calgary already has 10. New England wins out, Rochester loses out, and Minnesota loses one other game (against Buffalo, Calgary, or Edmonton). Then NE ends up at 10-8, Rochester is 8-10, and Minnesota and Buffalo are no better than 9-9. Minnesota wins out, New England loses to Toronto, Buffalo loses one to Minnesota and one other, Rochester loses two to Minnesota and two others. Then Minnesota is 10-8, Rochester is no better than 10-8 but loses the tie-breaker, and Buffalo and New England have 9 losses. Minnesota wins out, Rochester loses out, Buffalo loses one to Minnesota and two others, and New England loses twice. Then Minnesota is 9-9 and tied with Rochester, but they own the tie-breaker. Buffalo and NE have 10 losses. Toronto loses out, Buffalo wins out, and Rochester wins any 3 games. Toronto ends up at 11-7, Rochester is at least 11-7 and owns the tie-breaker, and the Bandits are 12-6. The worst Toronto can finish is 11-7 while the best Buffalo can finish is 11-7. Toronto owns the tie-breaker, so Toronto can’t finish lower than second. Rochester loses out. New England wins one against Rochester and four others. Minnesota wins two against Rochester and one other. Buffalo wins two against anyone. Then Rochester is 8-10, Buffalo is at worst 9-9, and Minnesota and New England are also at worst 8-10. In this scenario, New England and Minnesota will have the tie-breaker against Rochester so they’re out. Not sure about this one. If Rochester loses out, New England loses to Buffalo but wins the rest of their games, Minnesota beats Buffalo, Edmonton, and Calgary, and Buffalo beats New England and Vancouver, we’ll have a 4-way tie for second with everyone but Toronto at 9-9. I have no idea how that tie-breaker would be solved. Calgary wins out. Edmonton loses out. Vancouver loses to Calgary and twice to Eastern opponents. Calgary and Edmonton will both be 8-10 but Calgary has the tie-breaker. Vancouver has 11 losses and Colorado wins the west with Calgary in second. Calgary can finish no better than 8-10, Edmonton no worse than 9-9. In that scenario, Colorado has at least 10 wins so both Colorado and Edmonton are ahead of Calgary. Now that is what a trade deadline is all about. It’s rare for the current captain of a team to be traded. It’s even more rare for captains of two teams to be swapped. This trade confused a lot of people considering how important Suitor was to the Swarm. He was their captain, their leader in every way but scoring, the “heart and soul” of the team, and the phrase “fan favourite” doesn’t begin to cover it. But they traded him anyway which pissed off a lot of Swarm fans, judging by the comments on their Facebook post announcing the trade. In return they get another solid transition guy in Joel White, who has similar scoring numbers to Suitor but far fewer penalty minutes (Suitor has 20, White has just 2) and a lot more loose balls (117 to Suitor’s 60). Suitor is just over two months older than White so age wasn’t a concern for the Swarm, but I imagine White has a smaller salary than Suitor, which is. Considering how much anger and questioning of the sanity of the Arlottas we’ve seen regarding this trade, you’d think that they got nothing back. Joel White is kind of on the losing end here. 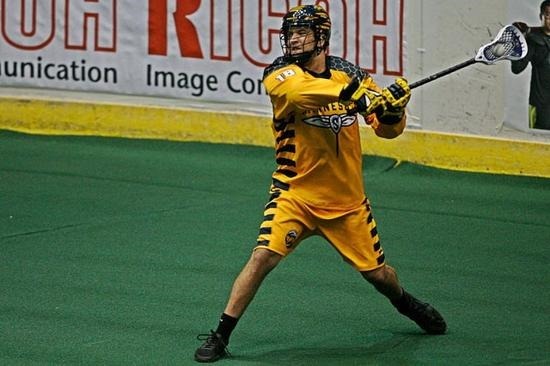 The Swarm are getting more loose balls and less time in the box, and though White is perhaps less of a vocal leader than Suitor, he’s still has leadership skills or the Black Wolves wouldn’t have made him the captain. Meanwhile the Wolves get a passionate guy who’ll run through walls for his teammates and is willing to fight if necessary, just in case Bill O’Brien doesn’t feel like it. Honestly, I’m not sure of the overall advantage of this trade for the Swarm. White might put up slightly better numbers, but if you’re going to anger most of your fan base and lose season ticket holders, is it worth it? While the Suitor deal raised a few eyebrows, the Swarm’s other major deal works out very well for them. Schuss had job commitments in BC that kept him out of a couple of games (though fewer than he originally expected), so this way he’s much more likely to be able to play. Both Schuss and Powless are young lefties (Schuss is 24, Powless 22). Powless just wasn’t fitting into the Stealth offense, as shown by his 7 goals in 11 games. 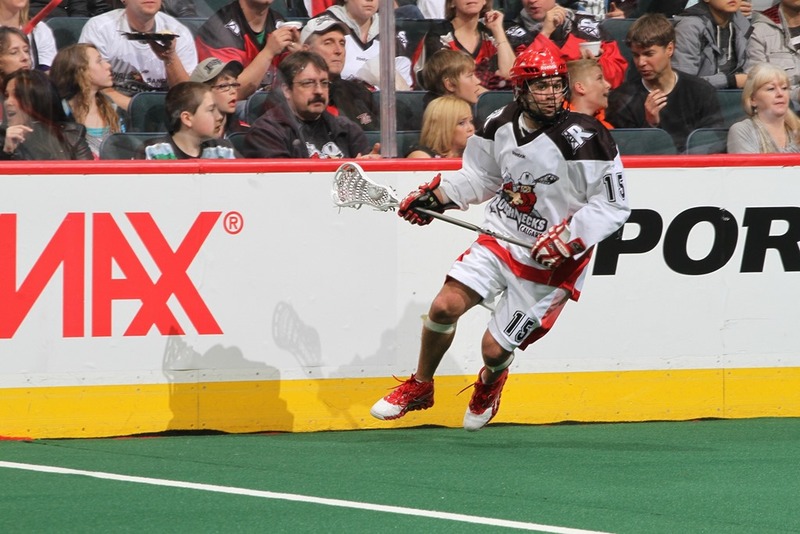 As said in an article in the Vancouver Province, Powless had as many 0-goal games in his 11 with the Stealth (7) as he did in three full seasons with the Knighthawks. Powless wanted out of Rochester because he didn’t want to be playing behind Cody Jamieson and Dan Dawson all the time, only to be playing behind Rhys Duch, Tyler Digby, and Corey Small in Vancouver. In Minnesota, I think he’ll be alongside Callum Crawford, Miles Thompson, and Shayne Jackson rather than behind them, so this could work out very well for them. Not much to say about this one – Flint had 2 points in 11 games with the Swarm last season but has yet to play this year. Two draft picks for a player with that little NLL experience tells you how highly the Mammoth thinks of Flint, who went to the University of Denver. After Scott Ranger retired in the off-season, I remember some talk that Dinsdale was likely going to get Ranger’s spot and thus lots more playing time. I honestly don’t know if the playing time increased, but while Calgary scored 38 goals in their first three games, Dinsdale was held pointless in all three. After that, his playing time dropped and by the time this trade happened, he’d only played in 6 games and only pulled in 6 points. This is consistent with his numbers over the previous two years (24 points in 27 games). With the addition of Sean Pollock onto the Roughnecks roster, Dinsdale’s playing time wasn’t likely to increase. Maybe a change of scenery (onto a team much more likely to make the playoffs) will do him good. Resetarits had a pretty good year in 2014, with 42 points in 17 games, but his production has dropped a little this year. His 21 points in 10 games is 6th on the Bandits but would be 7th on the Knighthawks. But playing behind Jammer, Dawson, Point, Walters, Hall, Vitarelli, and Keogh, it’s not clear how much playing time will be left for Resetarits. Batson is a defender with 0 career points in 8 games, but has only played in 2 games this year. This was the biggest deal of the day and as a Rock fan, I have to admit I was a little underwhelmed at first. Billings was the MVP runner-up in each of the last 3 seasons and the only player in NLL history to score 100+ points three years in a row. Crowley has been good, sometimes great, for Philly and New England, but he’s averaged around 75% of what Billings has done. I’d say Crowley’s a great player but not an elite one like Billings, so a one-for-one trade doesn’t seem to make sense. But first, we knew that Billings was going to be traded, and likely not for what he was worth. And second, Billings is coming off of knee surgery, and may or may not still be the elite player he was. If he is, then yes, New England wins this one. Going strictly by numbers, even if Billings is only 80% of what he was, New England still wins. But I wonder if Crowley being the #1 pick overall caused some people (myself included) to expect too much of him. He was expected to be the guy both in Philadelphia and in New England. To his credit, he’s been the top or second scorer on his team every year of his career, but hasn’t been the 90-100 point guy that I kind of expected. But in Toronto, he doesn’t need to be the guy. He can just be one of the guys. And since the guys include Hellyer, Hickey, Sanderson, and Leblanc (and hopefully Doyle next year), that’s not bad company to be around. While I’m sure he learned a lot from veteran Dan Dawson in their one year together in Philly, now he has the opportunity to learn from Sanderson and Doyle and who knows – maybe in a couple of years, he will be the guy on the Rock, but if Hellyer and Hickey keep playing the way they have been, he may not need to be. Assuming he’s not hobbled by the surgery, Billings is an exciting player to watch and I envy the New England fans who are able to see him at every home game now. He’s known for his playmaking ability and passing (he has twice as many career assists as goals), but he can score with the best of them including lasers from way out, cross-crease dives, and behind-the-back John Grant-style beauties. Would I prefer to have Billings back on the Rock? Yes, I have to admit that I would. But I’ve known for weeks that that would be unlikely, so I prepared myself for the likelihood that he’d be gone. Given the alternatives (the Rock lose him for nothing or scratch him for the rest of the season), I originally thought that adding Crowley would be better than nothing, but not much more than that. But I’ve warmed to the idea and similar to the Schuss-Powless deal, I think this could be good for both teams as well.